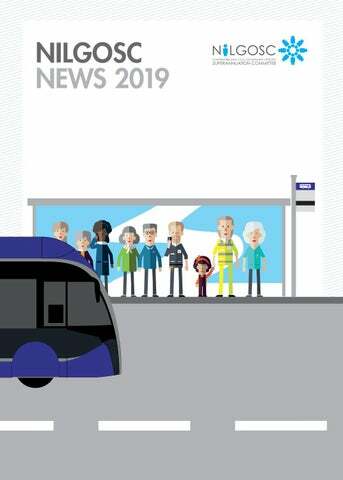 WELCOME TO THE 2019 NILGOSC ANNUAL PENSIONERS’ NEWSLETTER. It’s been a busy year in the Scheme with membership growing to 129,947 by March 2019 and the Scheme valued at an alltime high of approximately £8bn. We have decided to move the newsletter from Autumn to Spring going forward. We hope you enjoy reading this edition. PENSION PAYMENT DATES The table below shows the dates on which your pension will be paid each month. NEWS COMING SOON COMMUNICATION PREFERENCES Now that we have introduced My NILGOSC Pension Online we are keen to reduce the amount of paper that we use. Later in the year we will be launching a communication preferences project where you can tell us how you would like to receive your communications - either online or by post. If you would like to continue to receive your communications by post thatâ&#x20AC;&#x2122;s no problem. You donâ&#x20AC;&#x2122;t need to do anything right now; we will contact you later in the year to collect your communication preferences. If you decide to receive your communications online your annual newsletter will be automatically be uploaded to your My NILGOSC Pension Online account next year. MY NILGOSC PENSION ONLINE Have you signed up to My NILGOSC Pension Online? We know that having access to your pension details when needed is important to you, so it’s important to us. That’s why we have introduced a new self-service facility that allows you to access your pension details securely and update your information – wherever and whenever. We are delighted that over 2,500 pensioners have signed up so far! WE WANT TO HEAR FROM YOU Our newsletter is a great opportunity for us to keep you up to date with important information regarding your pension and the wider pensions industry. However, we would like to celebrate the community of pensioners that we have by including some of your stories in future editions. We are open to a wide range of content including; how you spend your spare time now that you are retired, tips for managing the transition from working to retirement, recipes, keeping your mind and body active, local clubs and societies that you may be a member of or anything else that you think may be relevant. If you would like to contribute something to the next edition of the Pensioners’ Newsletter please email communicationsofficer@nilgosc.org.uk or write to us using the address on the back cover of this newsletter. YOUR PENSION LET US KNOW NEW HOME? DON’T FORGET TO LET US KNOW! It is important to let us know if you move house because if we get undelivered mail sent back to us your pension will be stopped. You can update your address through your My NILGOSC Pension Online account or if you have chosen not to sign up to this service you can contact us by phone, email, post or in person at our office. CHANGING BANK OR BUILDING SOCIETY? If you want us to pay your pension into a different account, you can update your bank details using My NILGOSC Pension Online. Alternatively, you can notify the payroll team in writing or call into the office in person. Please allow us enough time to make the change and let us know three weeks before your next payday so we don’t try to make the payment to your old bank account, which may have already been closed. FREQUENTLY ASKED QUESTIONS IF I DECIDE TO GO BACK TO WORK, WILL MY PENSION BE AFFECTED? If you get (or already have) another job with any employer who offers the LGPS (NI), then you must tell us immediately – whether or not you join the Scheme again. For most people, returning to work with an employer in the Scheme will not affect their pension. However, the rules on additional compensation pensions are different and these pensions can be reduced or suspended when a pensioner becomes re-employed. If you are unsure whether your employer is in the Scheme, please visit the employers’ section of our website www.nilgosc.org.uk/employers. DO I NEED TO DECLARE MY NILGOSC PENSION AS INCOME? If you are claiming any type of social security benefit, i.e. pension credit, universal credit, Employment Support Allowance or housing benefit, your pension from NILGOSC must be declared. If you don’t, the authorities may treat it as fraud. If in any doubt check with your local benefits office. PAYING TAX IN RETIREMENT I RECEIVE BOTH A STATE PENSION AND A PRIVATE PENSION, HOW IS MY TAX PAID? Her Majesty’s Revenue and Customs (HMRC) decides your tax code and tells us how much tax to deduct. All members have a personal allowance, which is the amount of money you can receive from all sources without paying income tax. This year the allowance increased to £12,500. NILGOSC will deduct any tax you owe before we pay you each month. We will also deduct any tax you owe on your State Pension. If you are receiving payment from more than one provider, (e.g. from NILGOSC and a private pension) HMRC will inform one of your providers to deduct the tax for your State Pension. This will be shown in your P60 at the end of the tax year.  UNPRI facilitated engagement on water risks in agricultural a supply chains • the CDP’s 2018 non-discloser campaign • signing the 2018 Global Investor Statement to Governments on Climate Change • signing a UNPRI facilitated letter to the International Organization of Securities Commissions (IOSCO) on ESG disclosure. If you do not have access to the internet, or if you would like a hard copy of this Privacy Notice, please contact us using the details on the back cover. Requests in relation to accessing your personal data or exercising any other rights under data protection legislation should be made in writing or via email to the Data Protection Officer at NILGOSC at governance@nilgosc.org.uk. NATIONAL FRAUD INITIATIVE In order to prevent and detect fraud, we may share information with other bodies responsible for auditing or administering public funds. We participate in the National Fraud Initiative (NFI) run by the Northern Ireland Audit Office, which has statutory powers to conduct data matching exercises. As part of this initiative, we provide details of pensioners and deferred members so that the information can be compared to that held by other public bodies. This will ensure, for example, that a pension is not being paid to someone who has died or is no longer entitled. For further information about our participation in the National Fraud Initiative, please refer to the NFI Privacy Notice available on our website at www.nilgosc.org.uk/data-protection or contact our Governance Manager at governance@nilgosc.org.uk. If you would like a hard copy, please contact us using the details on the back cover. You are welcome to visit us from Monday to Friday, between 9am and 5pm. You do not need to make an appointment. However, we close on public and statutory holidays, so please phone first, to check that the office is open.